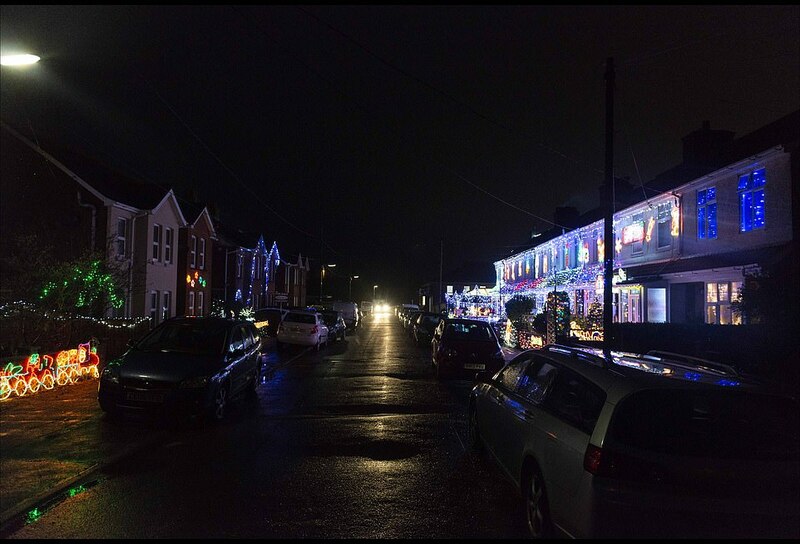 It has been dubbed Britain’s most festive street, but the Christmas spirit appears to have deserted half of the road’s inhabitants this year. 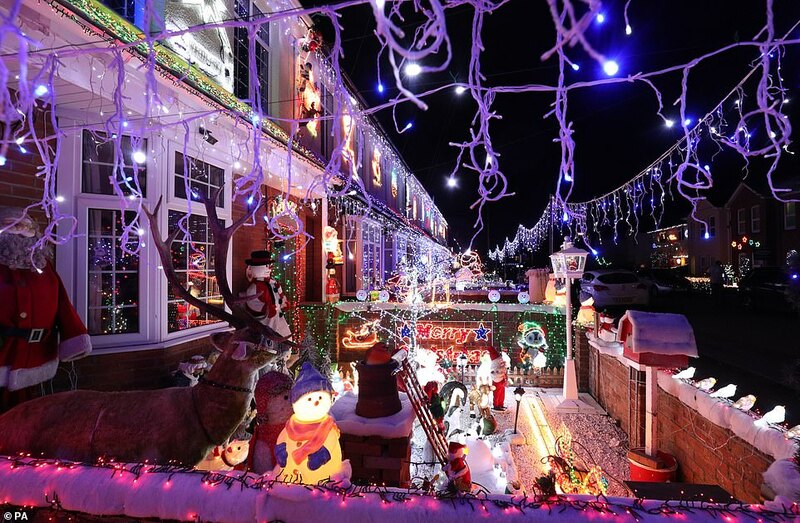 Byron Road in New Milton, Hampshire, is turned into a twinkling winter wonderland each Christmas, with an eye-popping display that attracts thousands of visitors from across the UK. 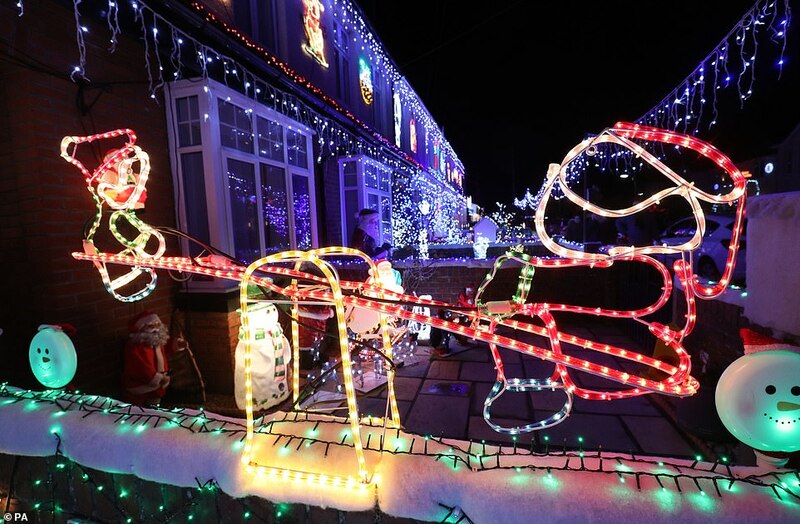 Residents in the road band together to deck their halls in luminous fairy lights and raise upwards of £70,000 for good causes. However not is all it seems behind closed doors, with some neighbours becoming fed up with the annual event, which sees the road closed and tourists standing outside their homes snapping photos. 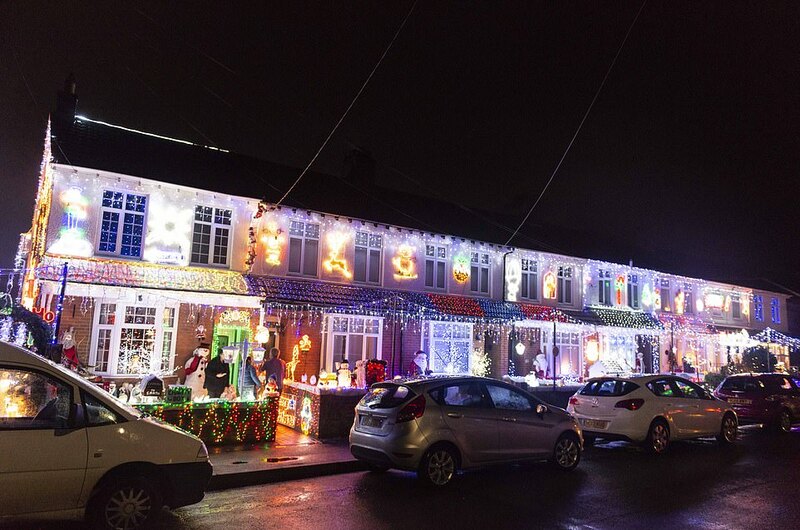 This year, many of the homeowners have opted against participating with the event entirely, claiming the street has become ‘too big for its boots’ and leaving their properties shrouded in darkness beside their illuminated neighbours’. 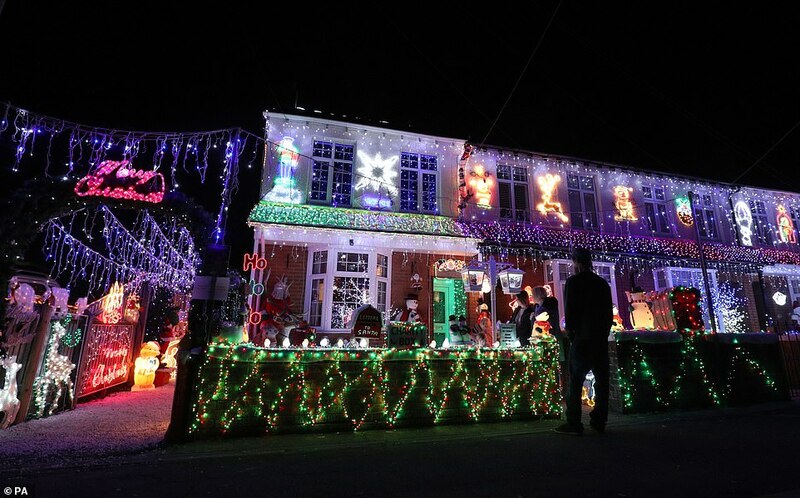 Adam and Sallyanne Gibson are refusing to put up lights on their house on principle after becoming fed-up with the chaos the display causes. The couple say the event has become too big in recent years, with it being advertised on local radio stations. Last year, I’m a Celebrity star Harry Redknapp turned on the display. The Gibsons claim the hordes of people have previously blocked their driveway with bad parking, scratched their car and sworn at then. The couple, who have lived on Byron Road in the New Forest town of New Milton for 12 years, are also fed-up with the amount of litter that gets left behind by the crowds. 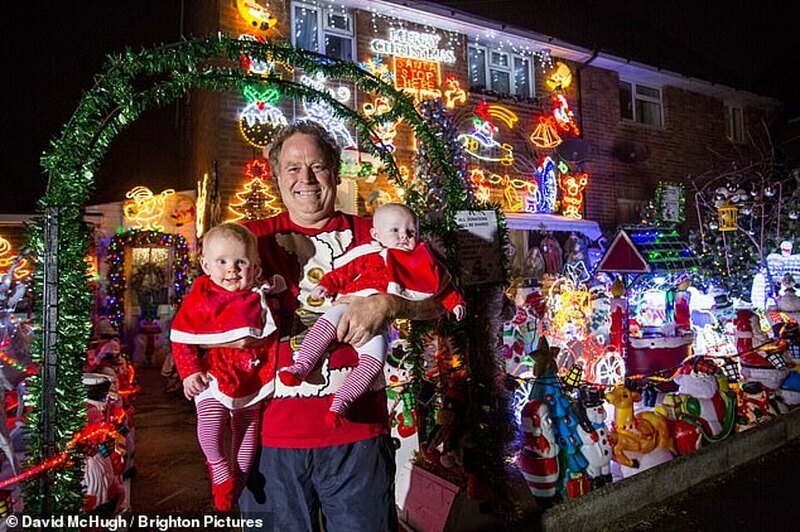 Their home is further down from the main row of 1980s terraced houses that are festooned with tens of thousands of lights. 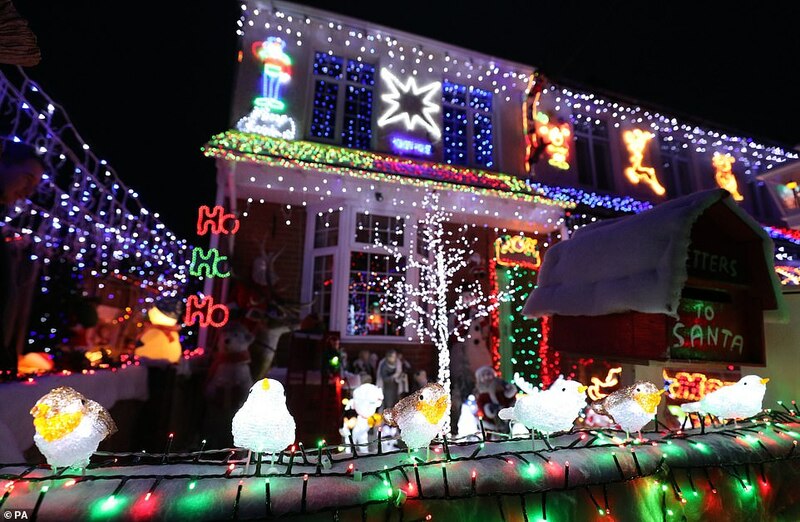 Mr Gibson, 52, said: ‘We used to put lights on our house but we stopped about two years ago as a point of principle really. ‘It’s not the lights themselves that are the problem, it’s everything else that comes with it. Too many people come down here now to look at them and it just gets too congested. ‘We have come home on more than one occasion and found cars parked right across our driveway. When you ask them to move they say you’re being miserable and swear out you. ‘We’ve even tried leaving cones out but people just throw them out of the way and park anyway. ‘One of the worst things is that you get families go to McDonalds which is nearby and bring it here and eat it while looking at the lights. ‘We often wake up in the morning and there is rubbish bags and litter everywhere. Since the light display has been advertised on local radio and the like it’s just got too big. Sallyanne, a 48-year-old schoolteacher, claimed their cars have been damaged by visitors in the past. She said: ‘People just force their way through in their cars and we’ve all had cars scratched and damaged. ‘My husband has had his van grazed and my daughter even had a hire car that was scratched right down the paintwork. Another resident, who asked not to be named, echoed the Gibsons’ comments. 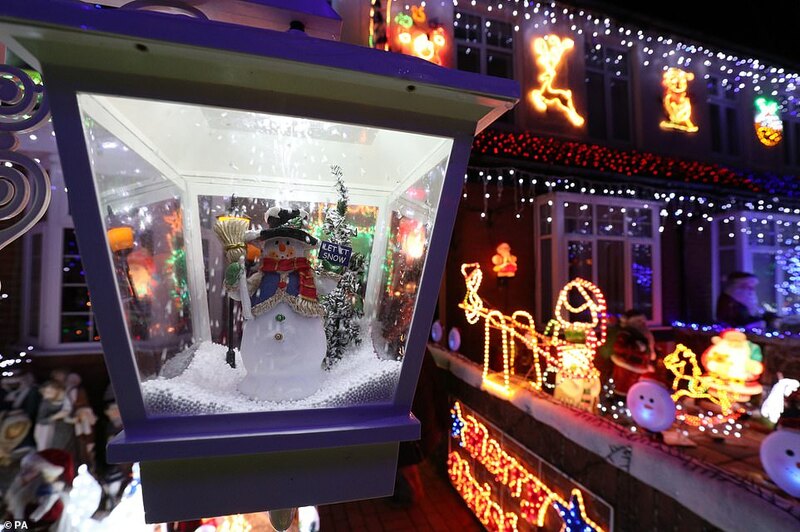 The light display began 14 years ago by resident Ged Hollyoake and has grown year on year. 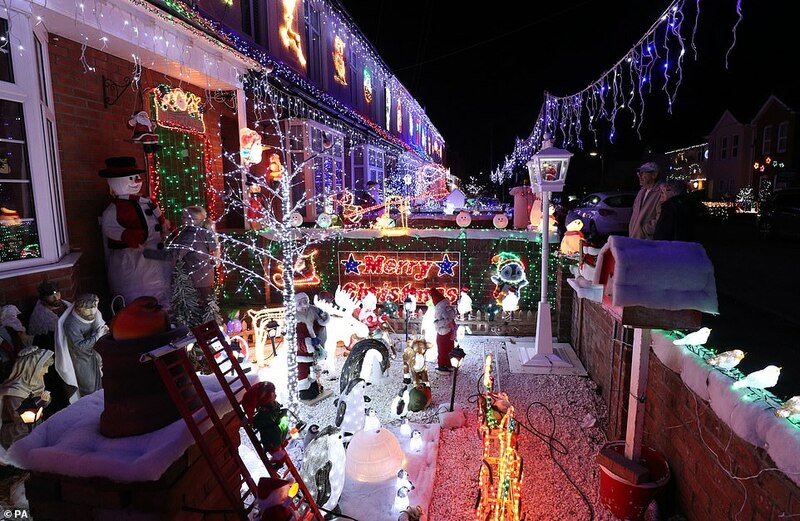 He takes responsibility for decorating a row of five terraced houses that include his with dazzling lights and inflatable Santas and snowmen and even pays the joint electricity bill of £250. 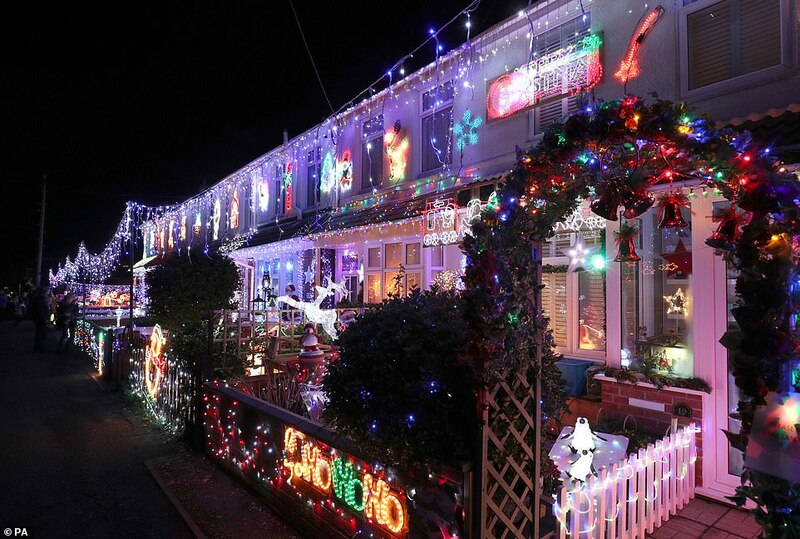 Another 10 houses in the road join in with the extravaganza that can attract more than 1,000 people a night. The display has raised over £70,000 for charity through donations over the years. 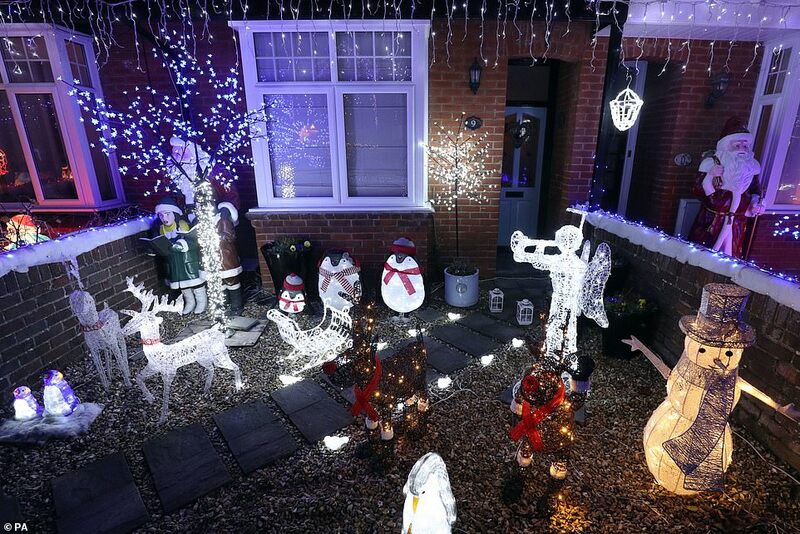 Meanwhile in Hove, East Sussex, couple Michael and Lyn Farnes transform their home into a winter wonderland to raise money for charity every year. 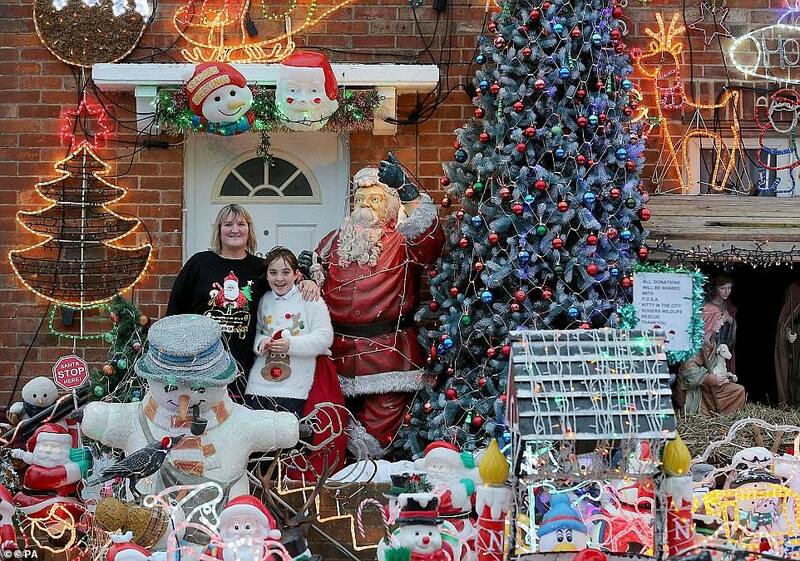 The couple start to put up their display in early November and have spent around £10,000 over the years – as part of a tradition they began simply to annoy their neighbour ‘who had a moan about it’. Visitors travel from miles around to view the house and make a small donation to their charities. 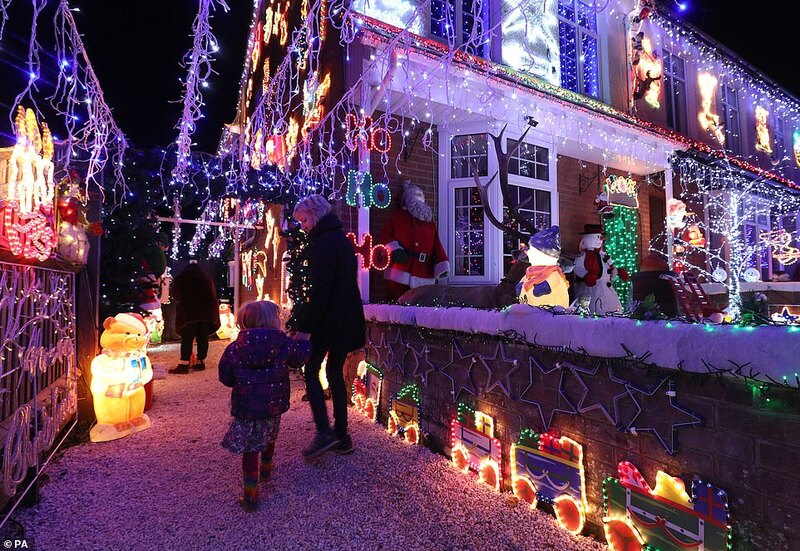 The display takes three days to set up with around 200 metres of electric cable feeding an estimated 30,000 twinkling fairy lights, 25 snowmen, 40 Santas, elves, reindeers, sleighs, penguins, robins and polar bears. There is even a full nativity scene, a huge Father Christmas sculpture and an icy pond. 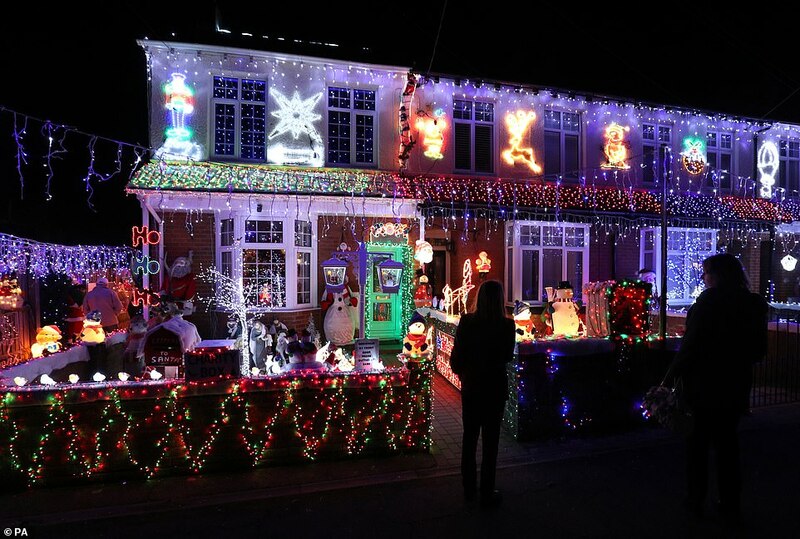 The couple started with just one set of twinkling lights 17 years ago and now Michael and Lyn have to meticulously plan their pageant of festive lights in an attempt to outstrip their previous year’s show. 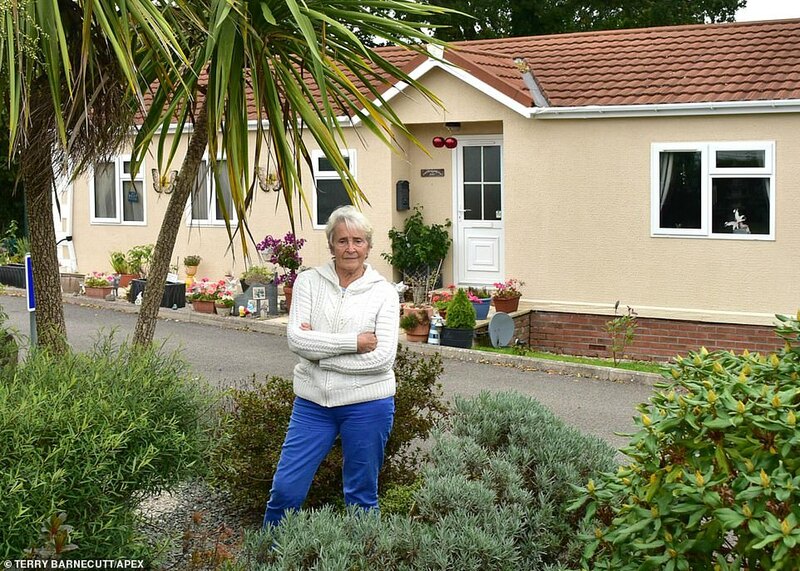 In Cornwall, Joanne and Geoff Britton claim they are ‘victims of a vendetta’ after becoming embroiled in a dispute with neighbours over lights on their house in the hamlet of Tregatillian. 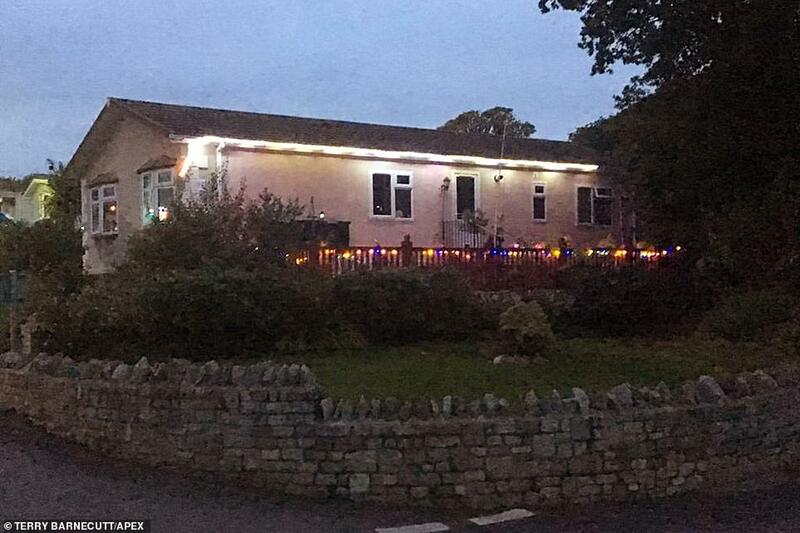 The couple say their rural retirement was being ruined by neighbours who had ‘refused’ to take down their Christmas lights since last November, Cornwall Live reports. The couple said the lights were attached to both sides of Kathy and David Cox’s property. But now, Mrs Cox claims the Brittons never approached them about the lights, which have been in place for six years.